Hunter Valley accommodation centers around the region of Pokolbin. Some are major resorts, other intimate guesthouses. Some are modern but built in Australian colonial style and many are converted from old mansions and cottages. Many properties in the region are rated four, four and a half and five star. The Hunter Valley holiday accommodation we represent are well located and have many creature comforts. For Friday and Saturday nights, a minimum stay of 2 nights applies for nearly all properties in the Hunter Valley. Weekend stays are very popular for Hunter Valley hotels, with Sydney only a 2-hour drive away. Pre-booking, especially for weekends is recommended. Pokolbin is at the centre of the Hunter Valley Wine Country, and a great base for exploring the many wineries the Hunter Valley has to offer. Pokolbin is approximately 2 hours drive north of Sydney. For nature lovers, couples wanting a romantic break or families looking for outdoor adventure, Barrington Tops is the answer. The Barrington Tops National Park is the closest World Heritage listed National Park to Sydney, and is approximately 3 hours drive from Sydney and 11 hours from Brisbane. Guests can visit the Hunter Valley from Barrington Tops, a day trip is recommended. For a quick comparison of prices and ratings for Hunter Valley accommodation visit our Hunter Valley hotels page. Best Western Hunter Gateway is located 2 hours North of Sydney and is the gateway to the Hunter Valley wine tasting region. 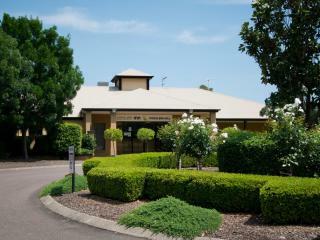 This Hunter Valley accommodation offers modern rooms that are all located on the ground floor. Best Western Hunter Gateway is just off the New England Highway offering facilities such as a swimming pool and complimentary WiFi. Best Western Hunter Gateway is perfect for those who need a break on route or for those who wish to travel to New Castle, Port Stephens and the Hunter Valley. Chateau Elan in The Vintage is Australia's finest golf and spa resort. Just two hours north of Sydney, or just under one hour from Newcastle Airport this Hunter Valley accommodation offers luxury in every aspect. Enjoy a round on golf at the Vintage Golf Course home to the NSW Open, this 18 hole course was designed by renowned golfer Greg Norman. Reside in a choice of luxury rooms, suites or villas to suit your stay and discover what the Hunter has to offer. Crowne Plaza Hunter Valley offers stylish and contemporary Hunter Valley accommodation situated within one of Australia's most famous wine regions. This Hunter Valley resort is surrounded by picturesque vineyards and is framed by the rugged Brockenback Ranges. Cypress Lakes Resort by Oaks Hotels & Resorts offers luxury villa style Hunter Valley accommodation with balconies boasting spectacular views. Recreational activities include an 18 hole championship golf course, 3 outdoor swimming pools and gymnasium. Also available is the Golden Door Resort Spa, for those in need of the ultimate relaxation. Eaglereach Wilderness Resort is a unique property perched on a mountaintop in Hunter Valley region. Set in four square kilometres of natural bushland, it abounds with native animals and birds. Accommodation includes resort rooms, lodges and cabins for couples, families or friends wanting to getaway. Each luxury lodge is exclusive to the guests' use, very well equipped and unique in style and facilities. There is a restaurant on site or guests can self cater. Grand Mercure The Vintage is situated 30kms west of the heritage city of Maitland and just 2 hours drive north of Sydney. Surrounded by vineyards, this Hunter Valley resort is part of The Vintage resort development and features two bedroom luxury apartments. Facilities include an award winning restaurant, swimming pool, spa, barbeque area and a spectacular Greg Norman designed 18 hole championship golf course. Surrounded by vineyards and adjacent to Harrigan's Irish Pub, Harrigan's Accommodation is well located in the centre of the Hunter Valley. Harrigan's offers guest rooms and apartments and facilities include a heated swimming pool as well as the Irish pub and restaurant. Harrigan's is part of the nearby Hunter Valley Gardens complex, which features restaurants, a wedding chapel, village shopping centre and beautifully landscaped gardens. Hermitage Lodge is located in the heart of Pokolbin in the Hunter Valley set amongst 25 acres of vineyards and classic Hunter countryside. This Hunter Valley accommodation offers guests spacious and stylish studio and suite rooms, all with a deck or veranda to view the vineyards and surrounds. Hermitage Lodge is also home to the award-winning Italian restaurant Il Cacciatore, serving guests delectable Northern Italian cuisine along with local wines. 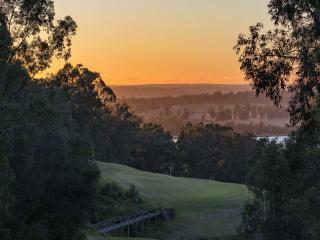 The Hunter Valley Resort is a lodge style resort set in the largest winery in the Hunter Valley. Family owned for many years, this 35 room resort is surrounded by a 45-year-old vineyard. 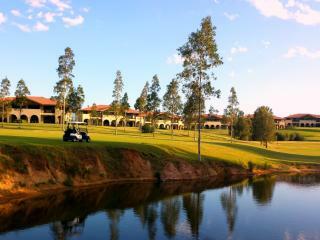 The Hunter Valley Resort also includes tennis, pool, spa, horse riding and bikes. For some great Hunter Valley holiday fun why not try the Wine School or tour the onsite winery. A delightful country manor style hotel, Kirkton Park Hotel Hunter Valley is set in 100 hectares of rolling countryside at the foothills of the Brokenback Ranges. Guests can choose from 70 guest rooms and suites many featuring period furniture and decorated in French provincial and heritage style. Kirkton Park Hotel Hunter Valley has beautifully manicured formal gardens and the offers views over the vineyards and wineries of the surrounding valley. Leisure Inn Pokolbin Hill is situated at the heart of Pokolbin Wine Country in the Hunter Valley of New South Wales. Surrounded by trellised grapes, wineries and fabulous award winning restaurants, the resort is built on 25 acres of seductive tranquillity. The luxuriously appointed studio, one and two bedroom chateau apartments, with a spa bath in each bathroom, blend superbly with the ambience of the surrounding vineyards - perfect for Hunter Valley holidays. Mercure Resort Hunter Valley Gardens is a boutique property with a selection of accommodation. Guests can stroll the beautifully landscaped grounds, relax in by the outdoor pool or more active guests can play a round of tennis. 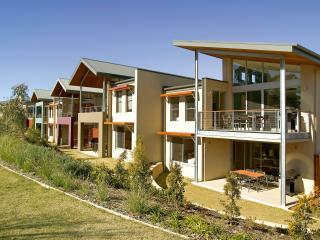 Hunter Valley Garden Village is next door, with two wine tasting cellars on site and cheeseworks. Set in 40 acres in the heart of the wine country, Pokolbin Village offers affordable Hunter Valley accommodation. Guests can choose from Suites and Villas, each is spacious in design and features a verandah overlooking the landscaped gardens. Pokolbin Village also features an outdoor swimming pool, full size tennis court and picnic areas. 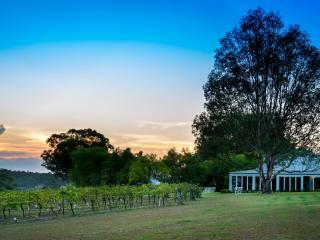 Spicers Vineyard Estate offers an intimate and romantic escape, ideal for couples after the Hunter Valley experience. The estate has stunning views of the Brokenback Mountains and the vineyards. There are many wineries close by as well as the Hunter Valley Gardens. The suites at Spicers Vineyard Estate feature king sized beds and a fireplace. Facilities at the Estate include a swimming pool and an award winning restaurant. is located in the heart of the Hunter Valley, a walk away from Pepper Tree Wines' tasting barn and the famous Robert's Restaurant. The 1906 retreat, was originally home to the Brigidine order of nuns in Coonamble, located nearly 600kms west of the Hunter. The building was moved in pieces to its present location, before being painstakingly reconstructed by a team of master tradesman. With only 17 guest rooms, The Convent Hunter Valley offers superb personalised service in a relaxing atmosphere.